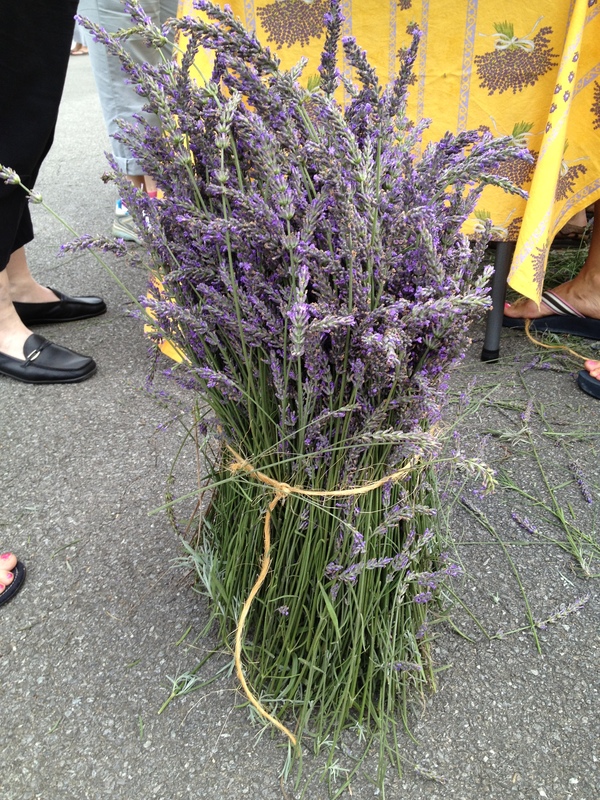 Lavender Festival 2012: Aromatic Delight! | Oh, the Places We See . . . 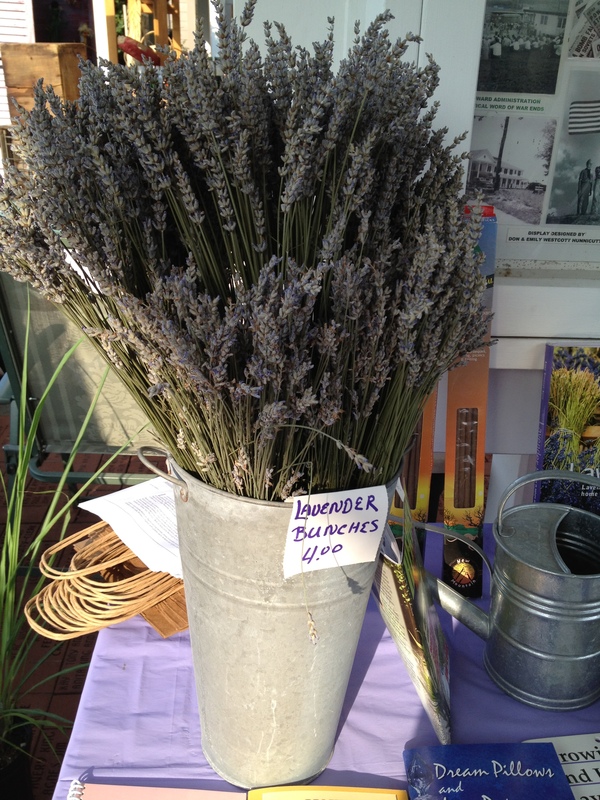 Lavender Festival 2012: Aromatic Delight! Reposting so that you can see what’s in store if you attend the 16th Annual Lavender Festival in Historic Jackson Square, Oak Ridge, Tennessee this Saturday, June 21 from 8 to 3. Click here for more information. I could almost smell the Lavender Festival from the parking lot — well, maybe not from that far away, but I almost could. It was exciting to walk past the Emma Lee Spray Park and Garden and enter Jackson Square in Oak Ridge at 8:00 AM Saturday. And I was in good company. Hundreds of festival-goers, anxious to get their hands on long stems of lavender bound into bunches, were looking forward to breathing in the fragrance that has lured thousands to this festival for 16 years. Sponsored by the Jackson Square Business Association, the Lavender Festival has a charm all its own. It’s not a bustling, noisy festival where visitors line up two deep at hot dog stands while listening to several stage bands at once! This is a quiet sort of gathering focused on the beauty of plants, hand-made crafts, and products from local gardens — a peaceful, earthy sort of festival where people mill around peering into booths filled with lavender in various forms: bouquets, wands, sachets, creams, oils . . . even edible products like lavender-infused honey or — yes, this is a real product — lavender ice cream! And one of many reasons this is a sweet-smelling festival is this — most of us are carrying string-tied bundles of lavender everywhere we go from Jackson Square to the adjacent Farmers Market! 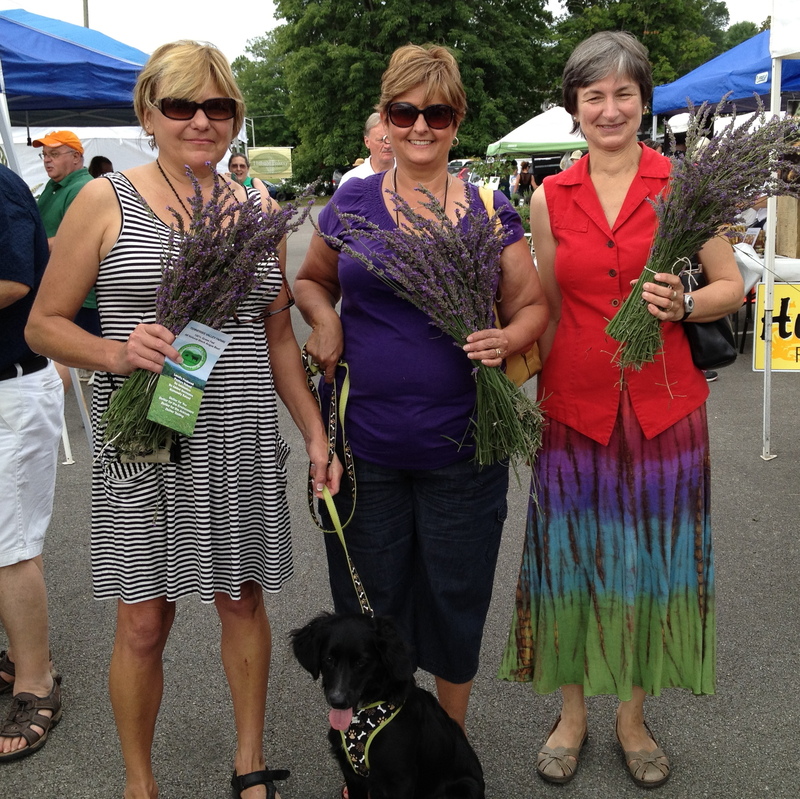 Three ladies and a dog with lavender bundles! First stop for me: the booth of Anne Freels, designer of cornshuck dolls. 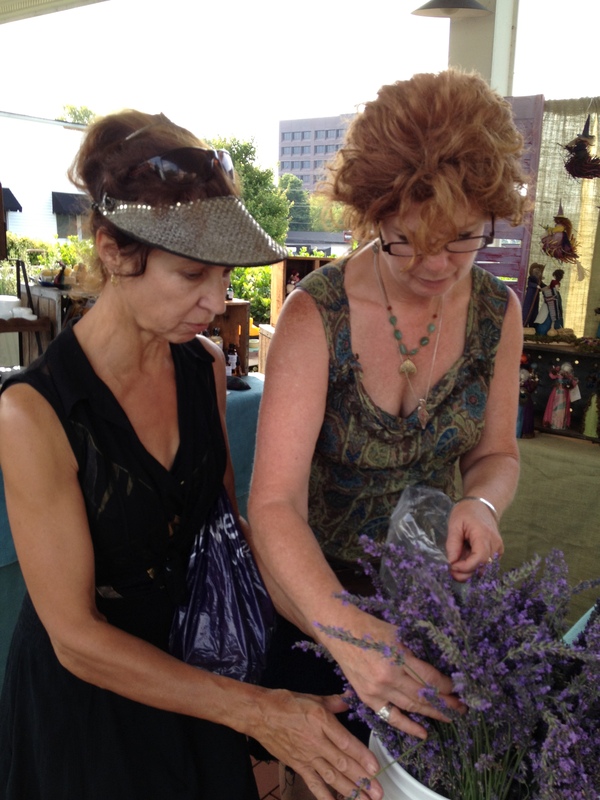 Anne shared the benefits of lavender with customer Lynn Carroll — how the fragrance has a calming effect. And bouquets dry naturally but retain their pleasantness for years to come. Anne Freels helps Lynn Carroll select the perfect bunch. 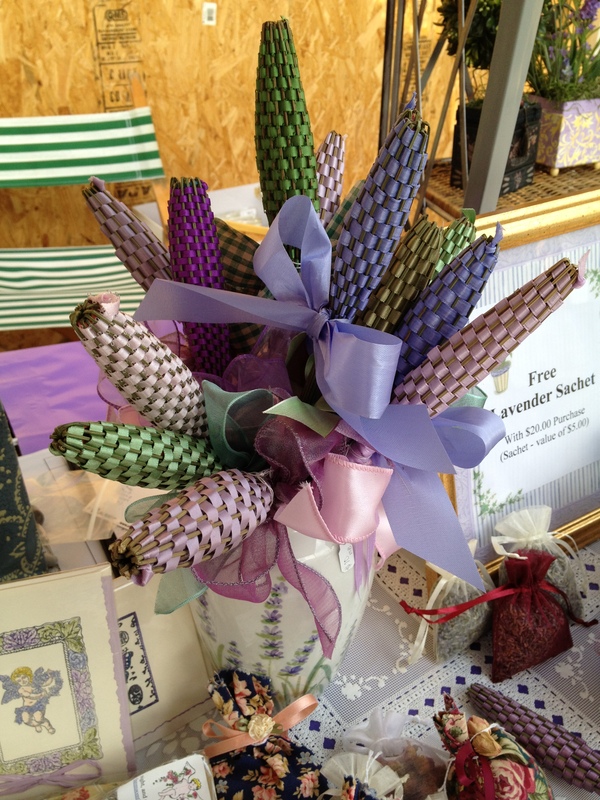 Marie Bullock offered beautifully displayed Victorian lavender wands woven with colored ribbons. Marie said, Victorian ladies didn’t always bathe every day as we do, so they kept a lavender wand to wave in front of themselves. The fragrance of lavender would mask any unpleasant odors. If the wand’s smell lessened over time, the lady would merely pinch the wand, releasing the fragrance into the air once again. Under the label Heaven Scent, Marie offers products made with lavender oil like moisture cream, angel drops, linen spray, and lavender toner. Who knew lavender could be so versatile! 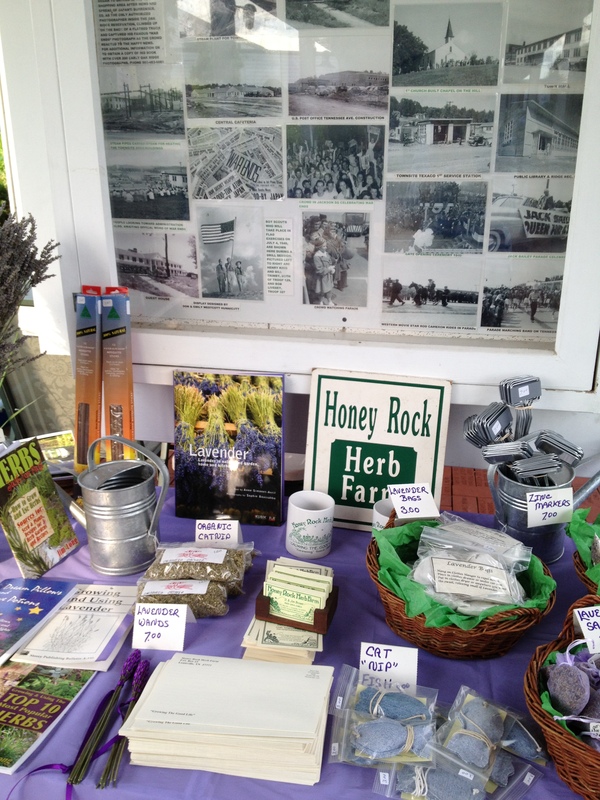 Honey Rock Herb Farm (Louisville) brought pictures of lavender fields, books on lavender, plant markers, bags and bunches of lavender as well as organic catnip and manuals on the care and growing of herbs. 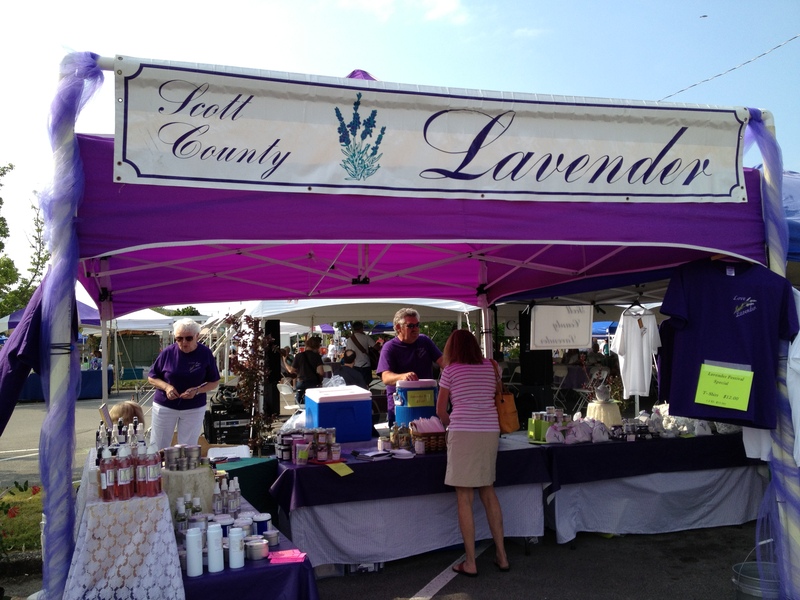 Perhaps the Profusion of Purple Award (if there ever was such a thing) could go to Scott County Lavender, a booth that was purple to the max — everything from creams to t-shirts and products bottled in purple. 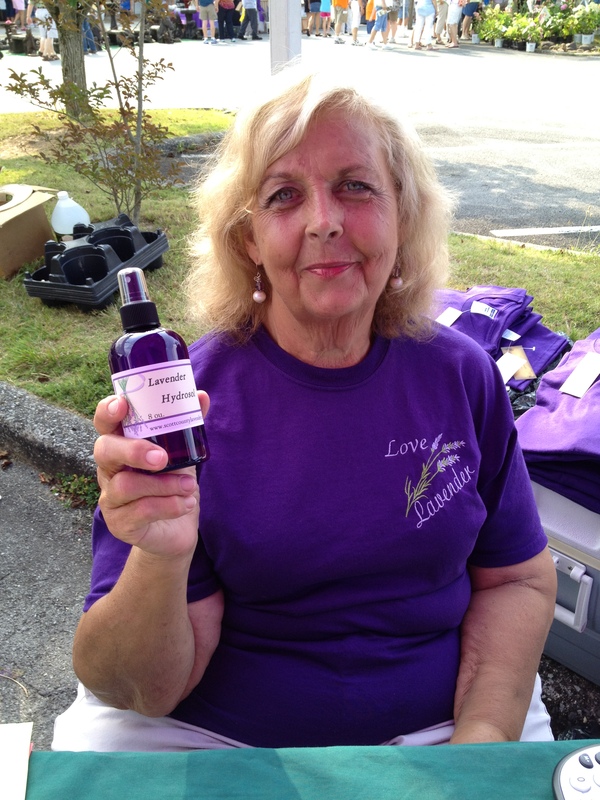 Pat Osborne told me about Lavender Hydrosol, a by-product of a distillation process. What remains after the process is pure mountain stream water infused with lavender essential oil. She said that essential oil could be compared to perfume whereas Lavender Hydrosol would be similar to cologne — not as concentrated but quite effective! Pat says you can spray Hydrosol on a pillows for a lingering fragrance. But Hydrosol spray can also kill germs, lessen the sting of sunburn, repel fleas in pet areas . . . even have a cooling effect on hot flashes! A wonder elixir, for sure, if it does all that! 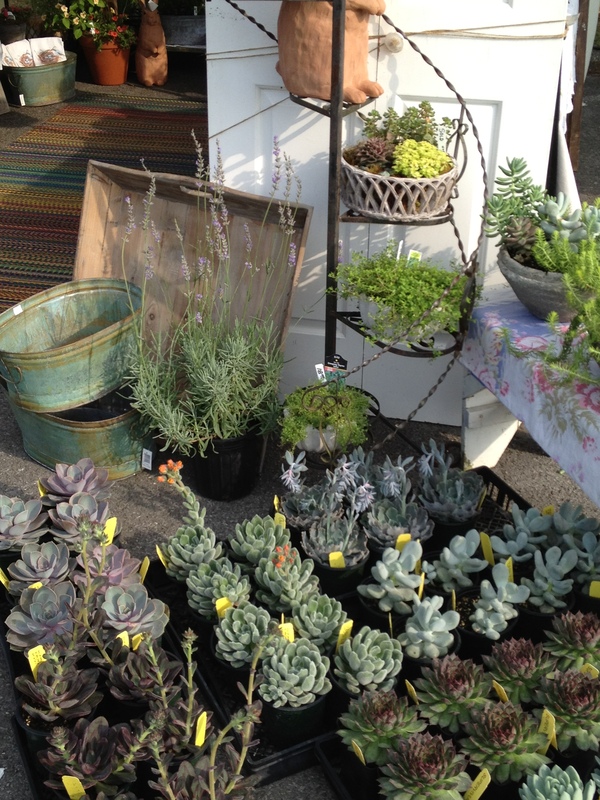 Many area nurseries and herb farms brought their healthiest, showiest plants for sale. 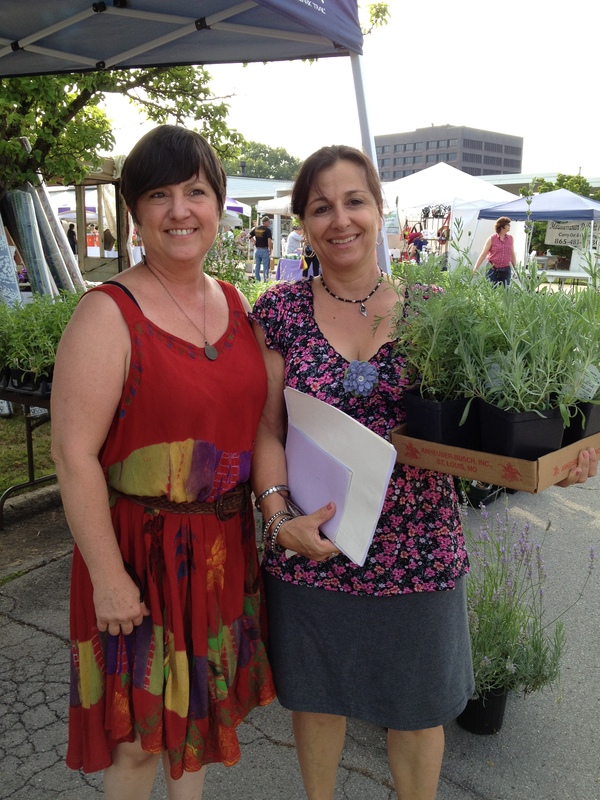 Melanie and Kathy from Erin’s Meadow Herb Farm told me about their location in the Marlow Community near Oak Ridge where herbs are their specialty, but they also have a wide selection of native plants and garden accessories. You really ought to come out to the farm right now, Melanie told me. It’s at its best. You’d love it! 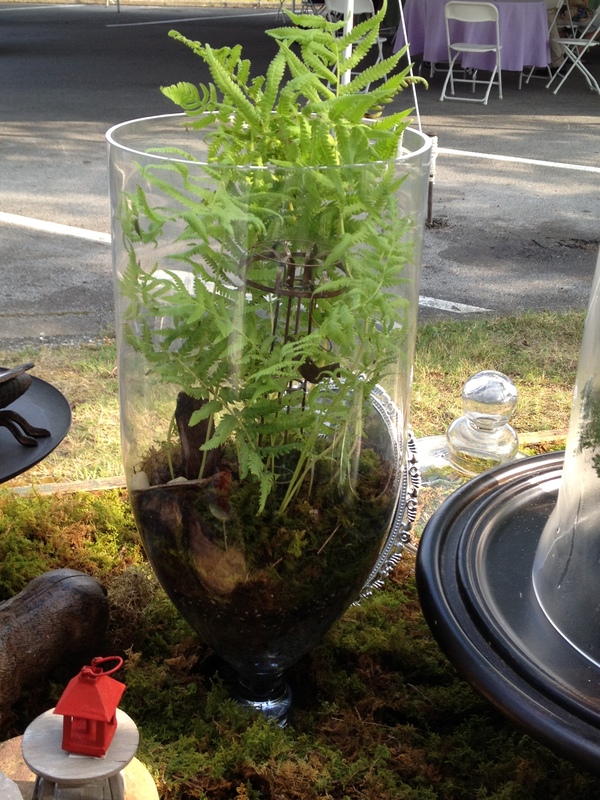 My favorite booth was this one by Erin’s Meadow Herb Farm. There’s just something appealing about weathered doors and antiques used as garden art. Although succulents have never been a favorite plant of mine (I think it’s their hard leaves or compact nature that I don’t like), I have been successful with these hardy plants in spite of how I feel. So I’ve come to look more closely at them as mainstays in my biggest flower pots. I especially like the looks of a whole flat of these from Erin’s Meadow basking in the early morning sun. 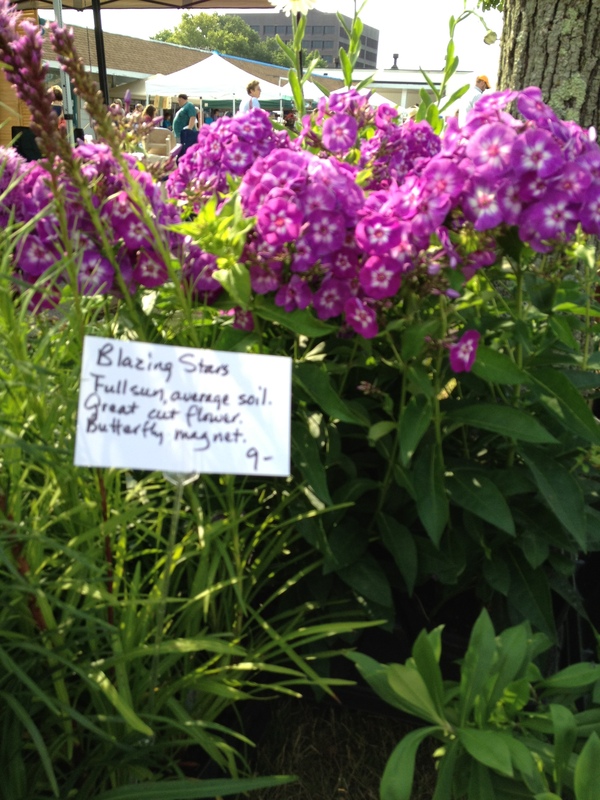 Some of the most colorful blooming perennials were brought by Sunlight Gardens. 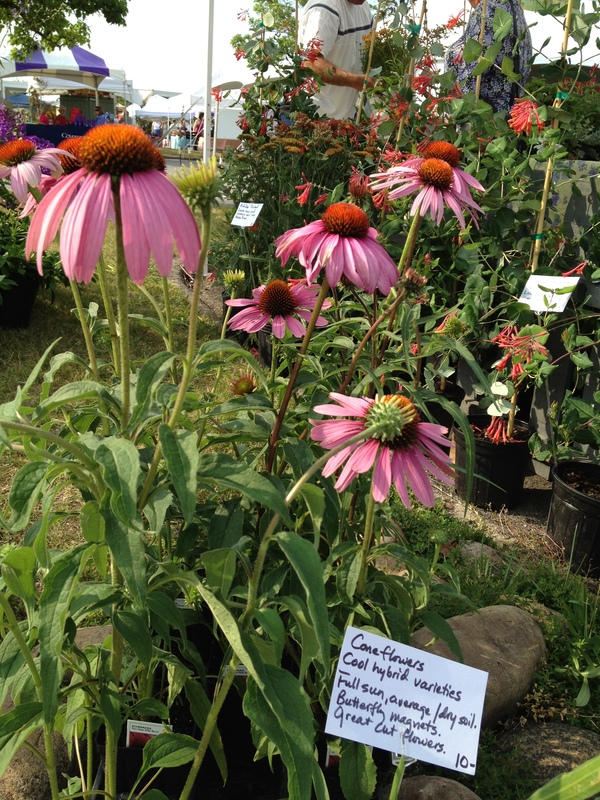 The sign near these native Coneflowers says they’re great for cut flowers! Working craftsmen are always a pleasure to watch at a festival. Scott Weatherly of Crossville stopped his work for a few minutes to tell me about the art of chair caning, a craft he’s practiced for twelve years. 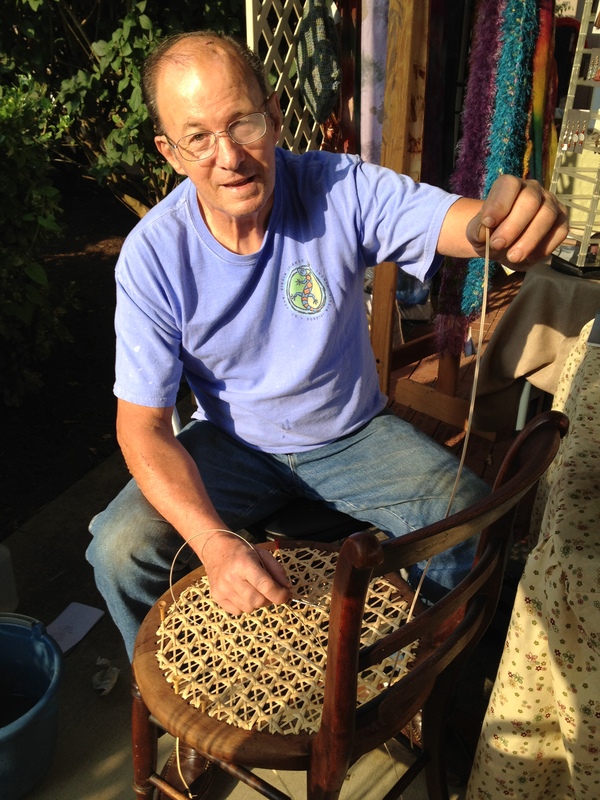 After soaking the cane, he weaves traditional patterns that look best with the lines of the chair. He was putting the finishing touches on this unusual pattern to bring new life to an old piece. 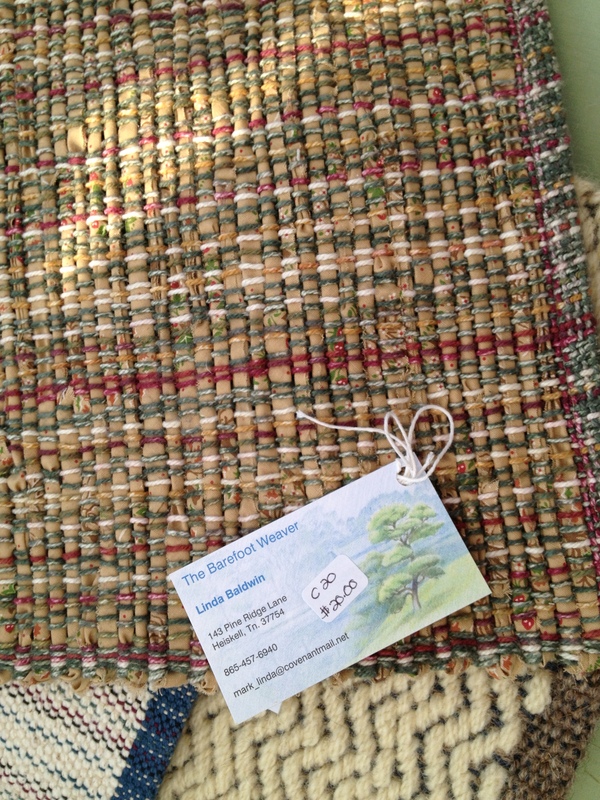 Linda Baldwin, The Barefoot Weaver, from Heiskell, has been weaving for eleven years. She told me that after she “got into” weaving, she loved the craft so much she bought the house next door to use as her studio! She weaves placemats, runners, pot holders, and other home essentials, and it thrilled me to watch her hard at work right there in her booth. This particular runner was something I don’t often see — it was woven with a combination of yarn and strips of torn cloth. Sturdy, yet beautiful — with a contemporary feel. 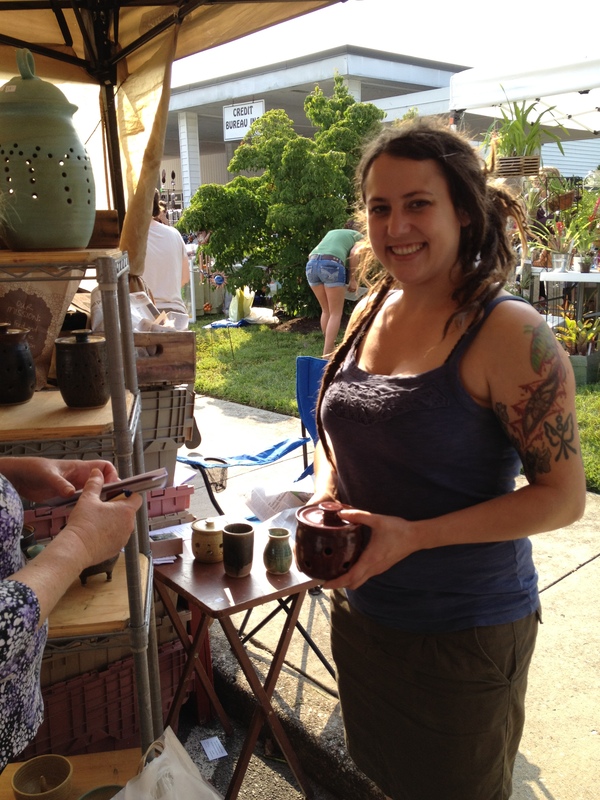 Melissa Ball of Stony Clay Station Pottery creates wheel thrown stoneware pottery in her studio in Lenoir City along with partner Benjamin Qualls. She was busy that morning judging from the long line waiting to pay her for her wares. I asked one customer if her pottery purchases were for gifts, but she smiled and said, Actually no. These pieces are just for me! 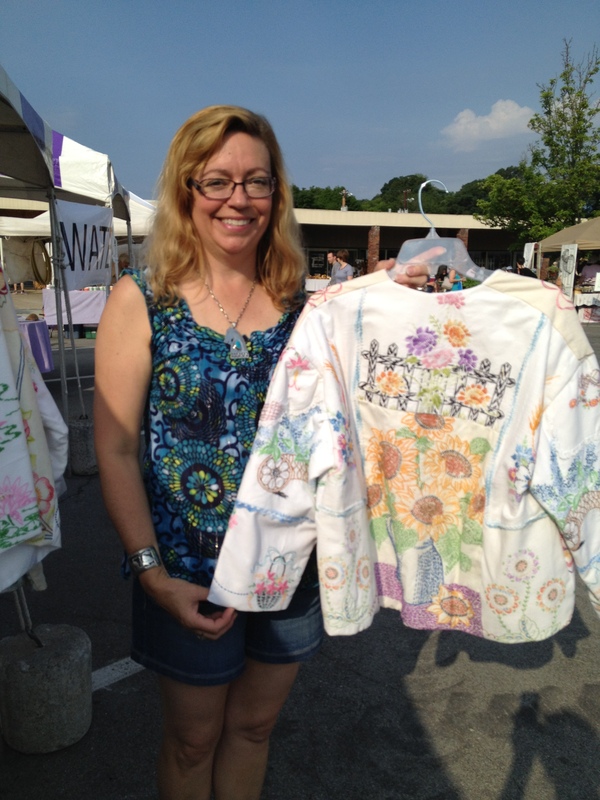 Finding old linens is a hobby that Tina Richey has had for years. Now she’s putting the embroidered tablecloths, napkins, pillowcases, etc., to good use! She gathers similar patterns (like florals, birds, dogs, etc. ); stitches the small pieces together to form larger blocks; and then cuts out fronts, backs, and sleeves to create these one-of-a-kind jackets! 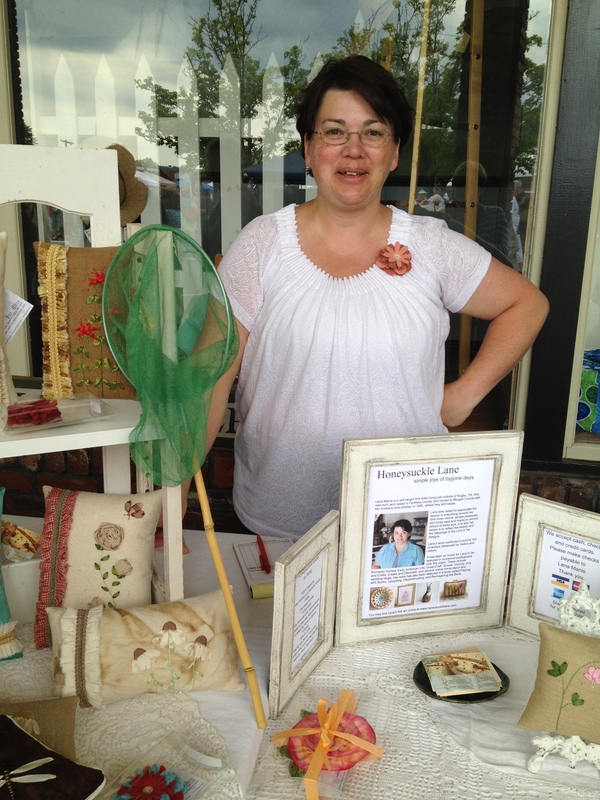 Her Knoxville business of wearable art and accessories is known as Spotted Horse Crafts. 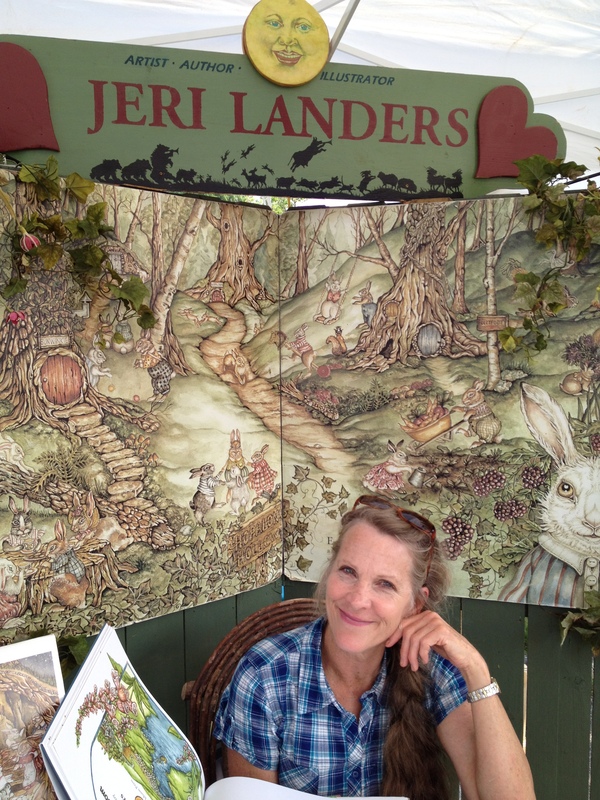 Jeri Landers, author and illustrator, signs a copy of her latest book. From Morgan County came Lana Manis whose business Honeysuckle Lane drew me in to her booth. Her hand-crafted creations — tiny pillows and lavender sachets — have been featured in Romantic Homes, Early American Life, Sunset, and Victoria. 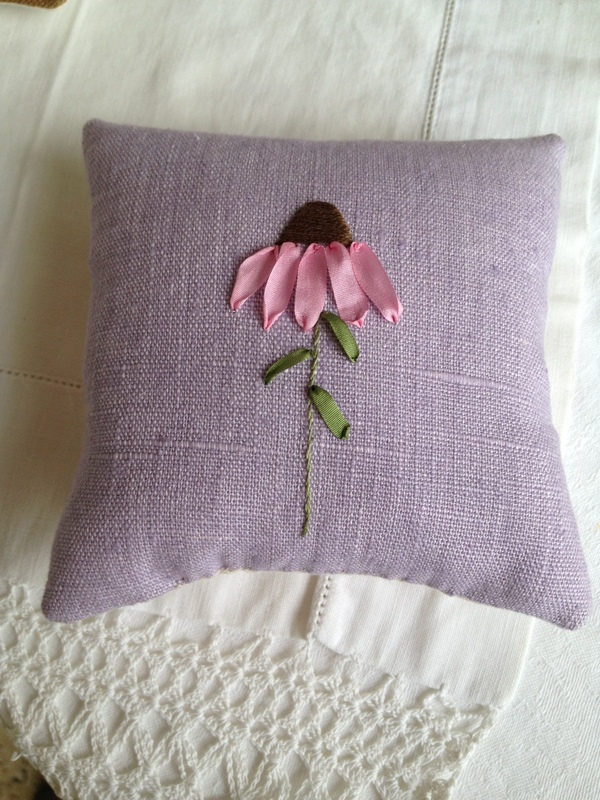 Lana Manis adorns pillows with flowers stitched from ribbon and thread. She uses bits of ribbon to form flower petals and leaves. Then she adds embroidery stems and stitchery embellishments — all against a backdrop of lovely linen in yummy colors. 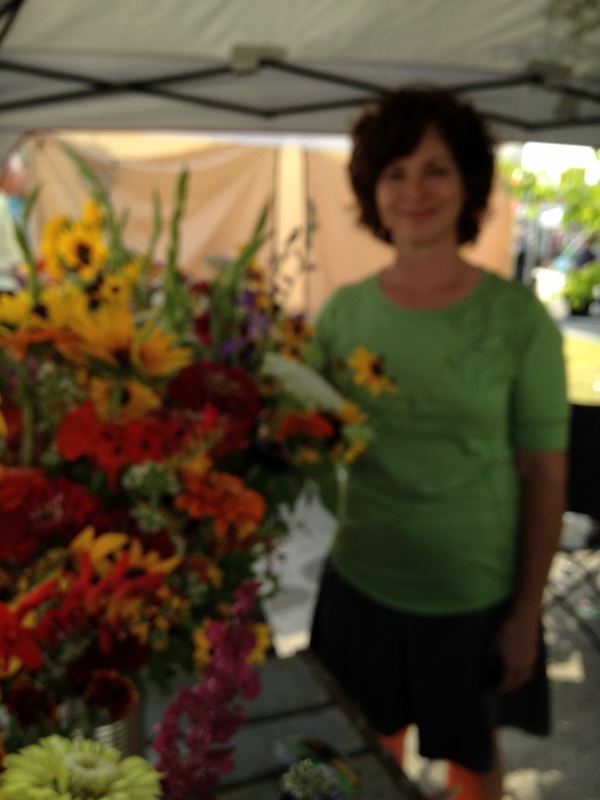 When she told me she sets up at the Knoxville Farmers Market on Market Square Wednesdays and Saturdays, I knew I could find her again and take home several of her bouquets for gifts in the near future! 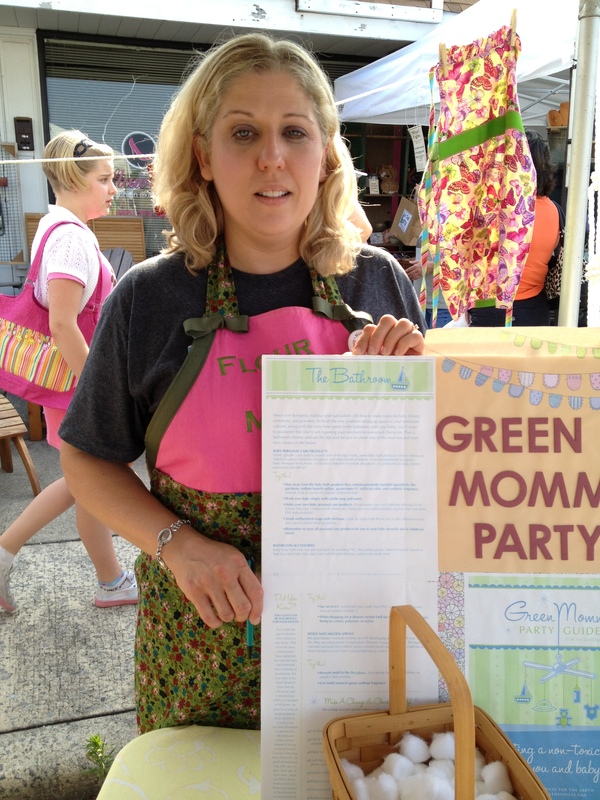 The creator and editor of Flour Sack Mama, Anne Brock, promotes green living on her blog (floursackmama.blogspot.com) and in her booth. You can find her on Facebook, Twitter, and Pinterest giving tips for thriftiness and better living that protects the environment and us, too! She offered children a chance to be a part of the festival by making little lavender sachets. The kids selected fabric, filled the pouches with lavender furnished by The Ferrell Shop, and then stitched the tops closed. 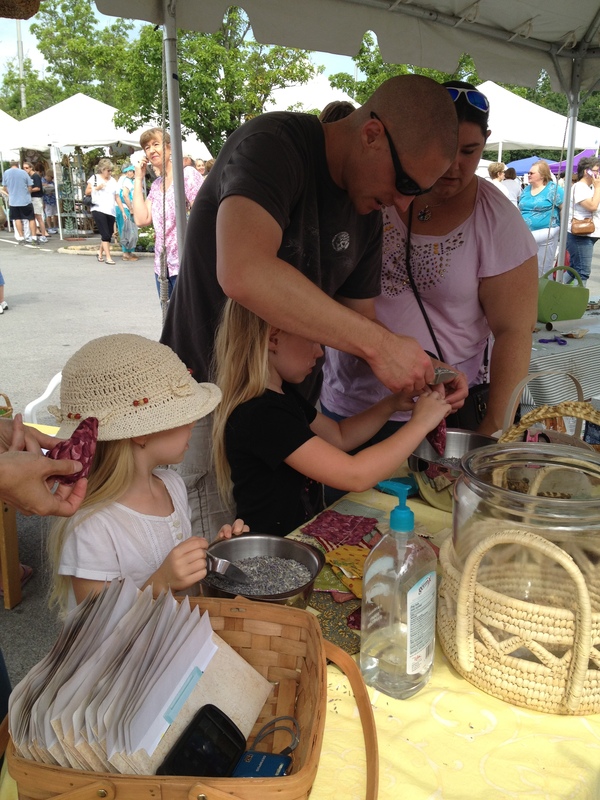 Here’s a dad helping his daughter put the finishing touches on her lavender sachet! Sweet, huh? 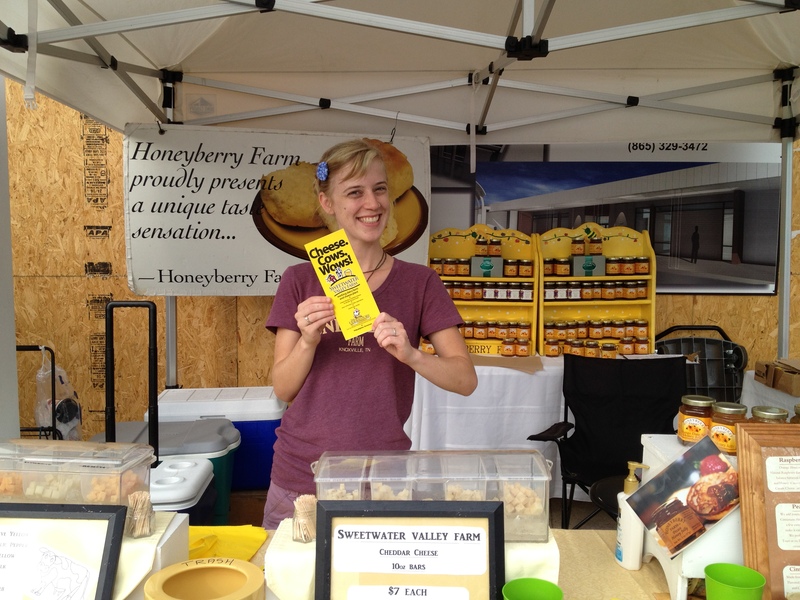 For the Lavender Festival, they passed out samples of Sweetwater Valley Farm Cheddar Cheese and let guests have a taste of Artisan Honey Jelly — that’s right, honey with the consistency of jelly! Mmmm. Would love that on a hot biscuit! Behind Jackson Square was the regularly scheduled Farmers Market, so I headed past the festival booths to see what the farmers had brought. The Cruze Farm girls (well, not many of them since they were manning booths at three locations all on the same morning) brought Lavender Ice Cream and Lavender Honey! Those cute Cruze Farm girls were there! Since I had to have my hands free to take pictures all morning, I made no purchases until the end. 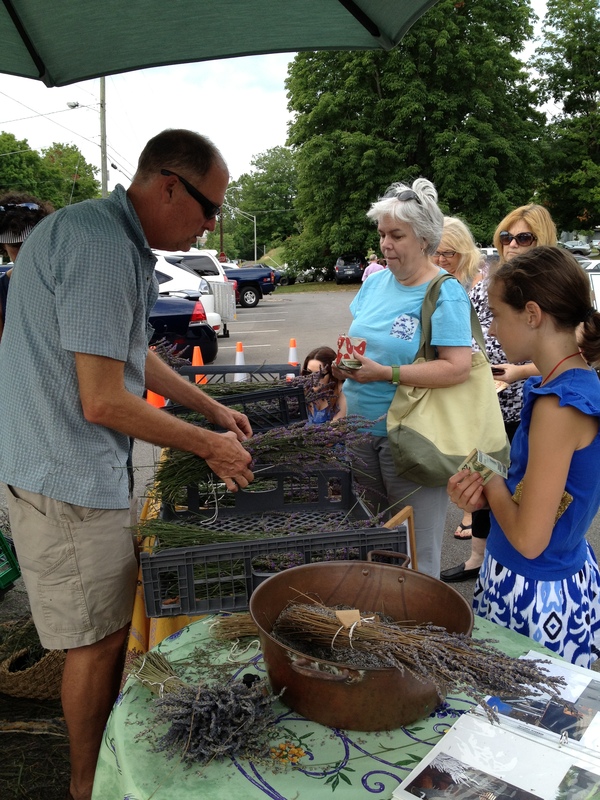 And what I came for was right in the Oak Ridge Farmers Market: Joe Hollar of Knoxville was grabbing handfuls of lavender from an open truck bed, tying those bundles with string, and making lots of customers (including me!) very happy! 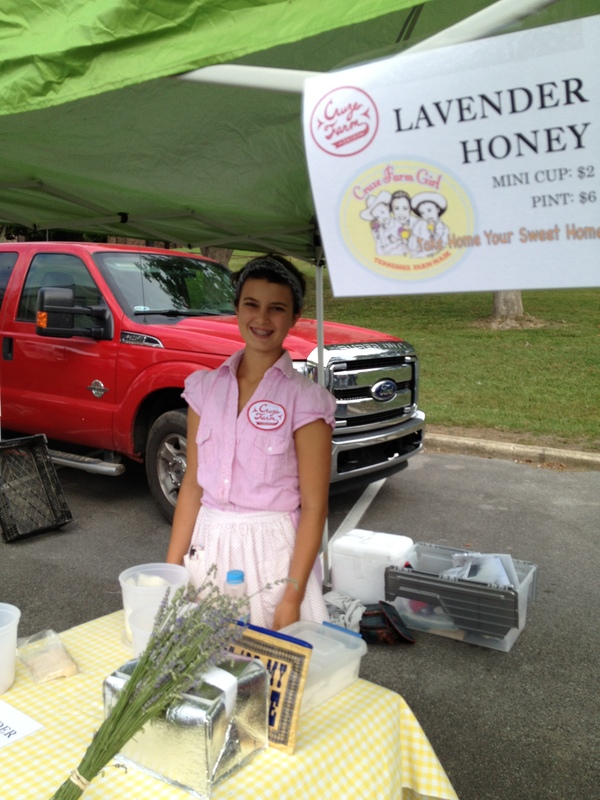 Knoxville lavender grower Dan Hollar had customers lined up! 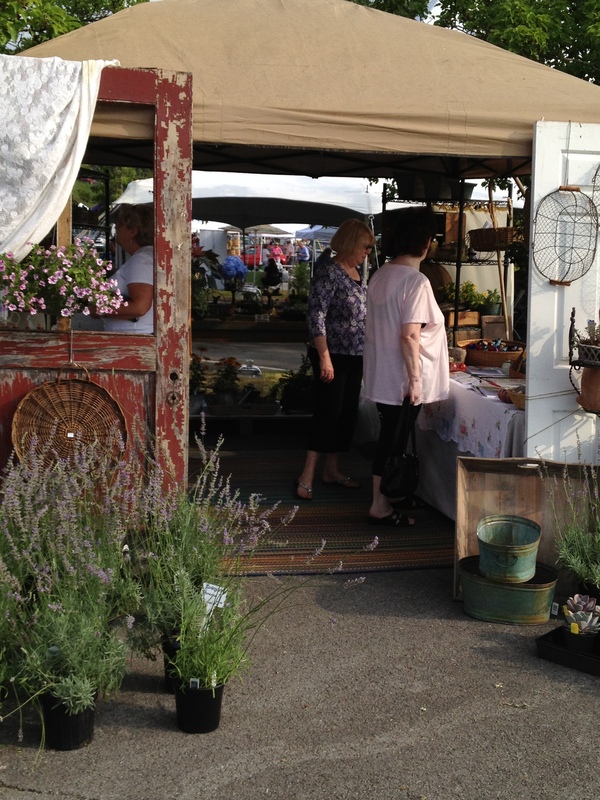 Each year the Lavender Festival offers a newly commissioned piece of art for sale. 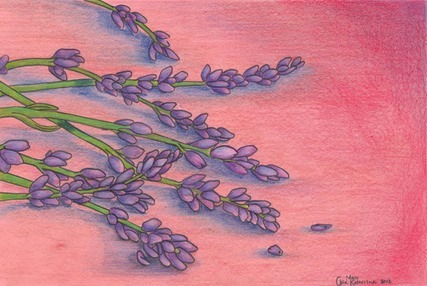 The website posted this lovely pastel work by Mary Katherine Chin titled “Lavender” as the 2012 featured art. If you want to come to the Lavender Festival in Oak Ridge’s Historic Jackson Square next year, be sure to check the website for dates and times. 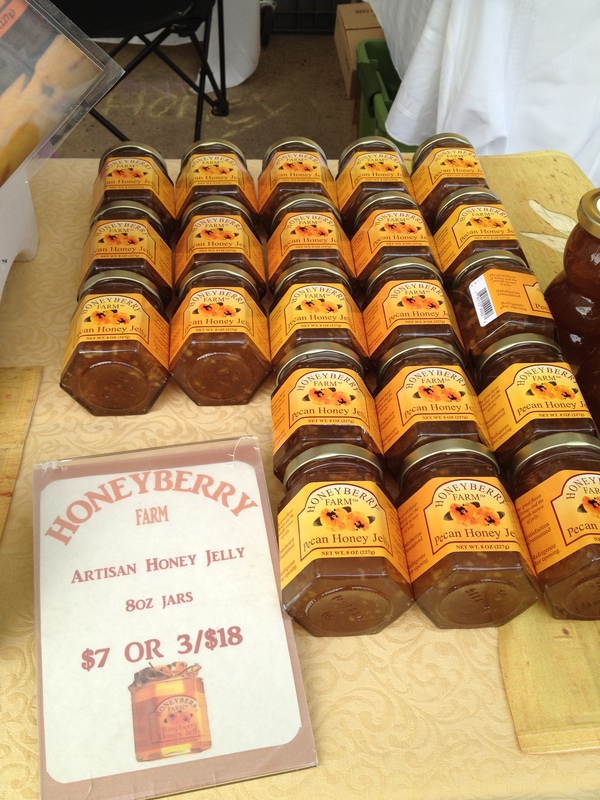 The Oak Ridge Farmers Market is open on Wednesdays, 3 to 6 P.M. and Saturdays, 8 A.M. to noon from mid-April through late November. 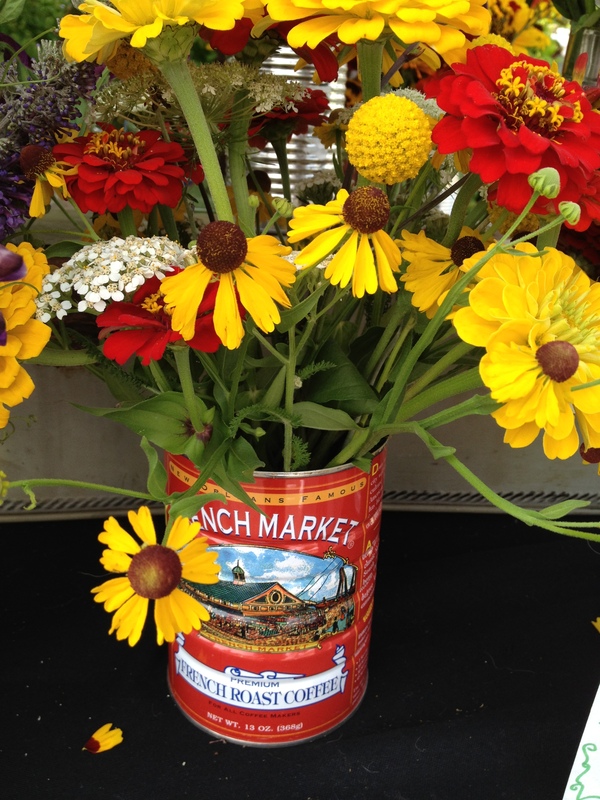 You can find locally-grown vegetables, herbs, honey, meats, cheeses, baked goods, plants, and fresh cut flowers! This entry was posted in Farmers Market, Festivals, Tennessee and tagged art, crafts, festival, flowers, honey, plant sale, pottery. Bookmark the permalink. 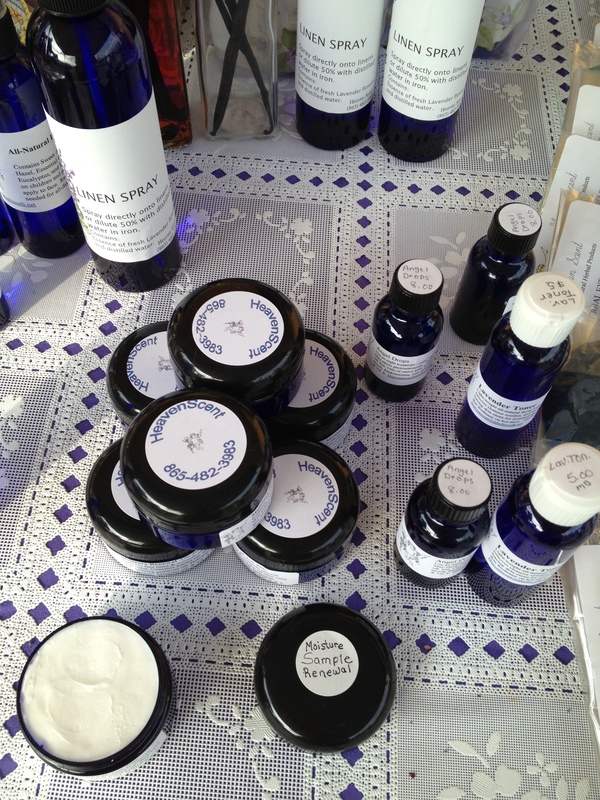 13 Responses to Lavender Festival 2012: Aromatic Delight! What a delightful festival; bet it smelled heavenly! 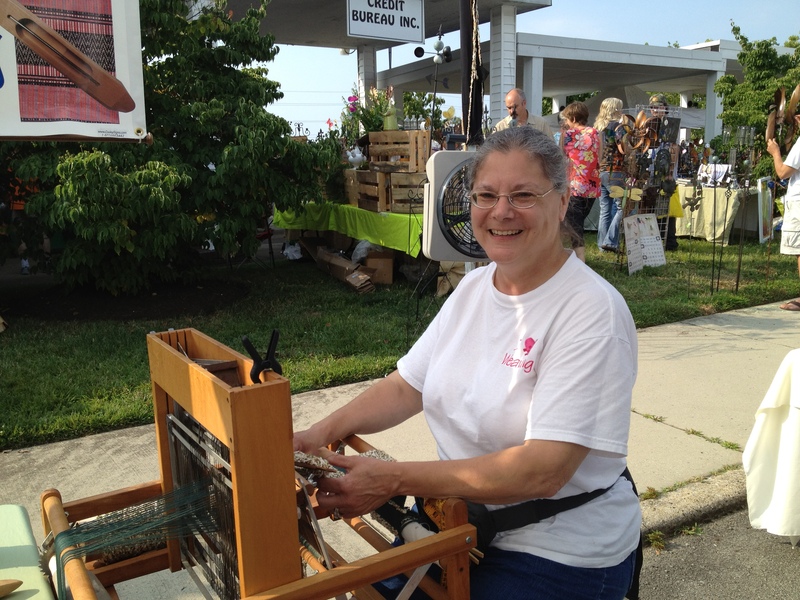 I’ve seen the weaver at fiber festivals; she does good work. You are so right! She was talented and personable. But there were many vendors who were talented. I hated to miss this year’s event, but maybe next year. Thanks for stopping by. It’s a lovely festival, and I hope to go again. The smell of lavender is everywhere! Yes rusha the fragrance is great! What is the season to visit this place! I can smell it from here. Wish I’d been there! It really is a pretty sight — so many quality vendors, fresh veggies at the market, and bouquets of lavender. Thanks for reading! So happy I was able to attend the festival — what a lovely event! Hope you enjoyed the day and will return next year! Thanks for commenting on my blog! I enjoyed your blog. We were in Squim, WA two summers ago and visited several lavendar fields. So beautiful. Here in FL, I have planted some just outside the window. Not as impressive as WA, but beautiful nonetheless. Thanks for the memories! So glad to hear from you! I would love to see lavender in bloom. A friend of mine toured France during the time of the harvest for her 40th Anniversary!!! It was great seeing you, as always! I love the pieces I’ve bought from you. Hope you can continue writing and illustrating for years!